As the name suggests, this featured collection by Nourison is inspired by the depths of the ocean and the natural colours and textures it produces. The Ocean Collection is a featured range from Nourison and it is one of many inspiring and elegant ranges in the Nourison range. 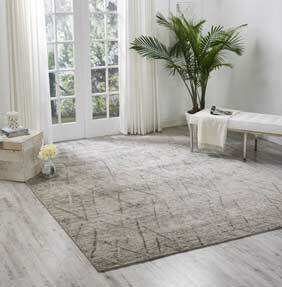 With over 30 years’ experience in producing stylish and original rug collections, Nourison continues to offer effortlessly contemporary and eye-catching rugs for the home. Each Ocean rug features a wonderfully soft hand-tufted pile. Gentle shimmering colourways and subtle textures imitate the movement of the waves and add to the natural oceanic feel of each design. Neutral colourways mimic both the beachside and the surf itself, creating a collection of soft blue, green and sandy tones which work easily in many styles of décor and design. Solid designs sit alongside subtle patterns, ensuring there’s a range of options to complement different interiors. Each area rug from the Ocean collection brings comfort, warmth and texture to any space in the home and evokes memories of the seaside, sandy beaches and even ocean cruises.